2 is You. Everybody else drinks. 3 is Me. The person who took the card drinks. 4 is Whores. Girls (so here, that’s probably everybody) drink. 5 is Five Fingers. You play a quick game of five fingers (also called “Never have I ever”), which I’d be really surprised if you’re not familiar with. 6 is Dicks. Guys (so here, probably nobody) drink. 7 is Heaven. Everybody points to the ceiling and the last person to do so drinks. 8 is Date. You choose someone else to become your “date” for the rest of the game. Whenever they drink, you drink, and vice versa. 9 is Rhyme. You say a word. Then, going around the circle, everyone else has to say a word that rhymes with that word. If someone can’t think of a rhyme or says a word that’s already been said, they drink. 10 is Categories. You say a category (like fruit or cars) and everyone going around the circle has to say something in that category (like apple and banana if it’s fruit, or jeep and cadillac if it’s cars). When someone says something that doesn’t fit or has already been said, they drink. Jack is Thumb Master. You become the “thumb master”, which means that at any point you can put your thumb on the table. Then, everyone else has to follow suit (no pun intended!) and whoever is last has to drink. You lose the power when someone else draws a jack. Queen is Question Master. Whenever you ask a question to someone, they must reply with a question. If they don’t, they have to drink. Like thumb master, this power is passed on to another girl who draws a queen. King is Rule Master. You get to make up a new rule. It can be whatever you want, just don’t go too crazy. If you feel like the bride isn’t having a good enough time at her bachelorette, you could make it “the bride has to drink every time.” That’s a popular one. Ace is Waterfall. You start drinking, then the person next to you starts, then the person next to them, and so on and so forth. The person next to you can’t stop until you stop, and so on and so forth. As you might imagine, this is a killer for whoever’s at the end, especially if some of your guests can chug. There are tons of rule variations, so if someone knows a different one that you like better, switch it up. Everyone has their own house rules for the game. 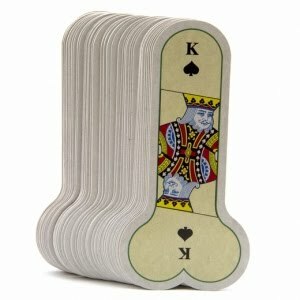 You can play kings, or any drinking card game, with any set of cards, obviously. But if you do have the money to spend, this is a fun way to spice up your drinking games at your bachelorette - I guarantee all the girls will love it.